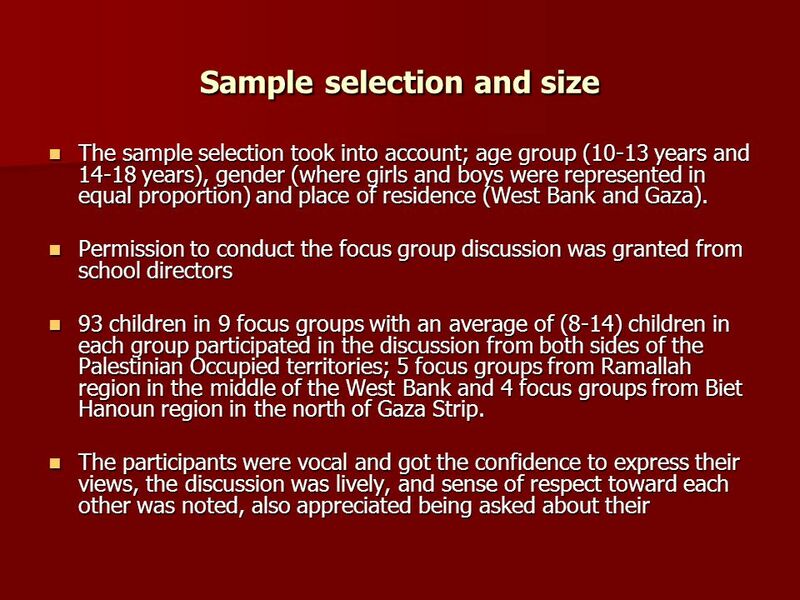 Palestinian children in armed conflict Report Sumaya Y. Sayej RN MSN Ph D AL-Quds University Submitted to UNFPA June 10/2007 Presented as part of the Garca. 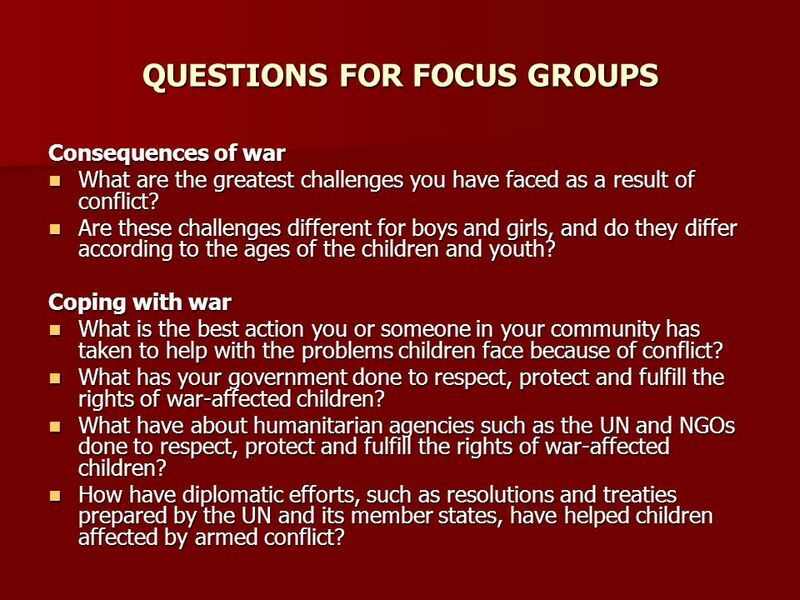 5 QUESTIONS FOR FOCUS GROUPS Consequences of war What are the greatest challenges you have faced as a result of conflict? What are the greatest challenges you have faced as a result of conflict? Are these challenges different for boys and girls, and do they differ according to the ages of the children and youth? Are these challenges different for boys and girls, and do they differ according to the ages of the children and youth? Coping with war What is the best action you or someone in your community has taken to help with the problems children face because of conflict? What is the best action you or someone in your community has taken to help with the problems children face because of conflict? What has your government done to respect, protect and fulfill the rights of war-affected children? What has your government done to respect, protect and fulfill the rights of war-affected children? What have about humanitarian agencies such as the UN and NGOs done to respect, protect and fulfill the rights of war-affected children? What have about humanitarian agencies such as the UN and NGOs done to respect, protect and fulfill the rights of war-affected children? How have diplomatic efforts, such as resolutions and treaties prepared by the UN and its member states, have helped children affected by armed conflict? How have diplomatic efforts, such as resolutions and treaties prepared by the UN and its member states, have helped children affected by armed conflict? 6 Peace and reconciliation What do you think has been the most important factor towards advancing a peace process and building reconciliation in your community and/or country? What do you think has been the most important factor towards advancing a peace process and building reconciliation in your community and/or country? What opportunities are there for young people to participate and express their concerns? What opportunities are there for young people to participate and express their concerns?Recommendations Are there any issues and/or groups of young people who are affected by conflict that have not been mentioned and should be addressed? Are there any issues and/or groups of young people who are affected by conflict that have not been mentioned and should be addressed? What would you recommend to be done – and by who – so that all children affected by conflict have their rights respected, protected and fulfilled? What would you recommend to be done – and by who – so that all children affected by conflict have their rights respected, protected and fulfilled? 7 Findings A number of issues were identified by the children which constitute risk factors that they need to challenge: Broadly, the children responses can be grouped as describing problems derived from their: Sense of security Sense of security Socio-economic and educational difficulties, Socio-economic and educational difficulties, Issues associated with conflict - related violence. 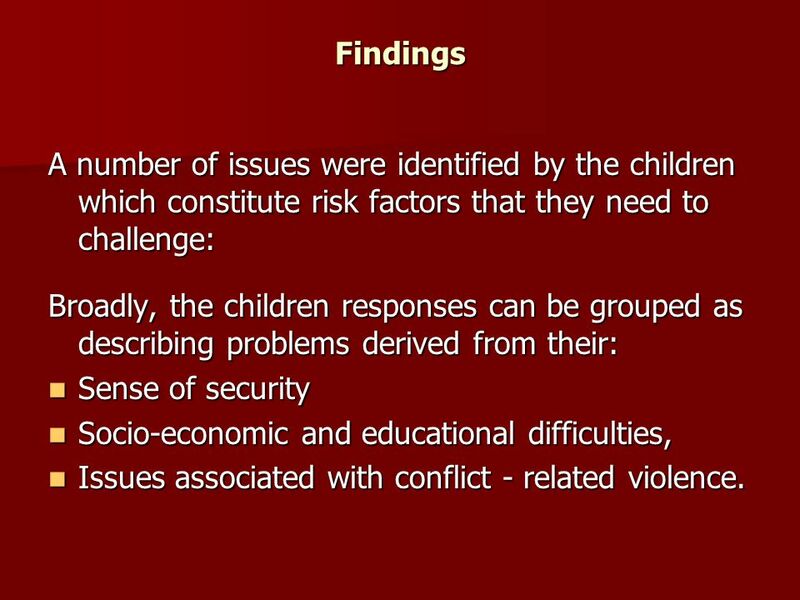 Issues associated with conflict - related violence. 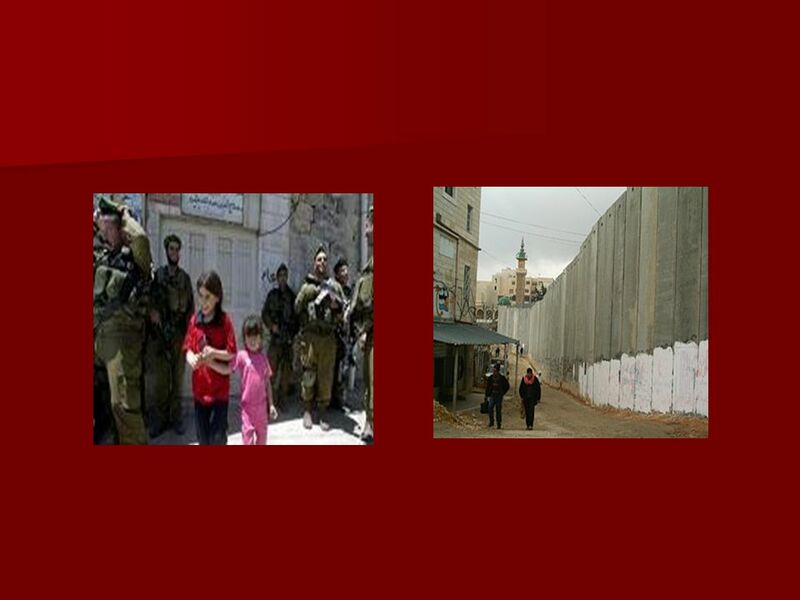 9 On the other side; the majority of West Bank children concerns were related to the discriminating wall; they expressed sense of insecurity, loss of freedom and the feeling of being under surveillance have increased their sense of rage, humiliation and disrespect. On the other side; the majority of West Bank children concerns were related to the discriminating wall; they expressed sense of insecurity, loss of freedom and the feeling of being under surveillance have increased their sense of rage, humiliation and disrespect. Coupled with the enormous check points and personal search for every Palestinian going through these points; the children considered it as another demeaning factor that makes them feel oppressed and frustrated and most of the girls and boys expressed the feeling anxiety and worried to go through these check points as Fadel 17 from Ramallah said “we are always under pressure and really this is not a kind of life that any human being should live”. Coupled with the enormous check points and personal search for every Palestinian going through these points; the children considered it as another demeaning factor that makes them feel oppressed and frustrated and most of the girls and boys expressed the feeling anxiety and worried to go through these check points as Fadel 17 from Ramallah said “we are always under pressure and really this is not a kind of life that any human being should live”. 11 The issue of economy and financial status was of major concern expressed by the interviewed children 14-18 years in both regions. 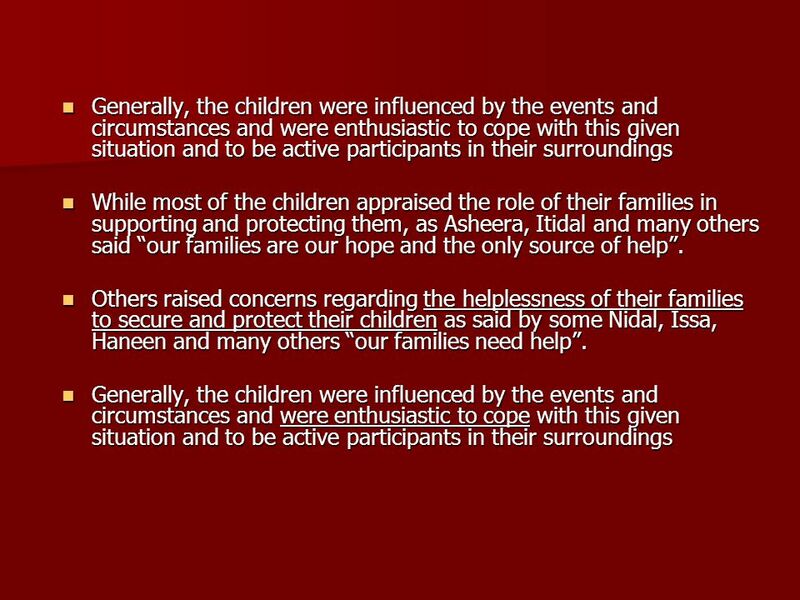 The children reported that they themselves had less pocket money, their parents have limited resources, and that they have observed changes in how family members interacted with each other regarding these matters The issue of economy and financial status was of major concern expressed by the interviewed children 14-18 years in both regions. The children reported that they themselves had less pocket money, their parents have limited resources, and that they have observed changes in how family members interacted with each other regarding these matters Economic decline and lack of financial and/or physical access to schools has resulted into thousands of children have not had regular classes in their schools Economic decline and lack of financial and/or physical access to schools has resulted into thousands of children have not had regular classes in their schools The major concerns expressed by the children interviewed were about the quality and effectiveness of the education they received through the last academic year, as Dana 16 years said “this is a year of ignorance” The major concerns expressed by the children interviewed were about the quality and effectiveness of the education they received through the last academic year, as Dana 16 years said “this is a year of ignorance” The girls explicitly were more of concern than boys regarding the frequent school closures as they consider school a place for socialization as stated by some "school is a place that we can go and socialize", other girls said "school gives us a chance to exchange stories and ideas". 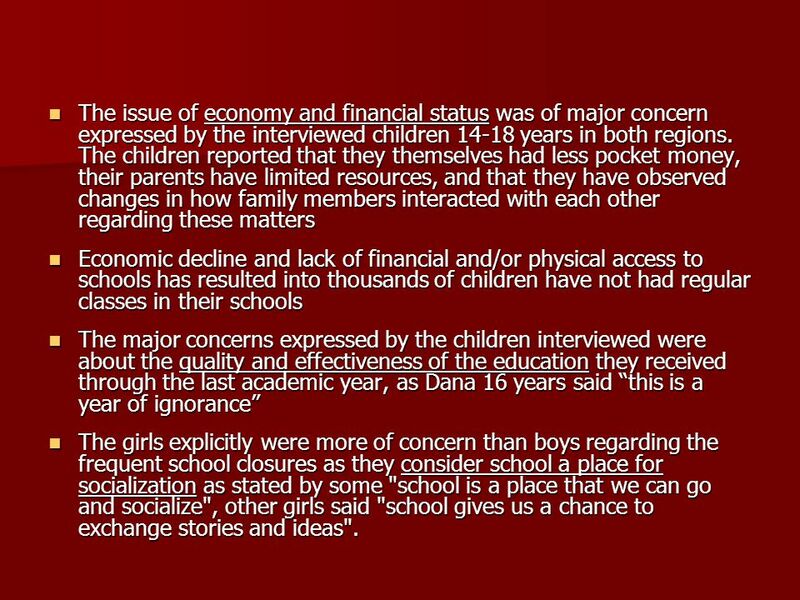 The girls explicitly were more of concern than boys regarding the frequent school closures as they consider school a place for socialization as stated by some "school is a place that we can go and socialize", other girls said "school gives us a chance to exchange stories and ideas". 12 What is the best action you or someone in your community has taken to help with the problems children face because of conflict? Most children expressed their coping mechanisms and means of help to face the challenges of conflict and to improve their lives is primarily by developing academically and socially as Salah, Issa, Maram and others said “the best way to cope and to develop is to finish our education Most children expressed their coping mechanisms and means of help to face the challenges of conflict and to improve their lives is primarily by developing academically and socially as Salah, Issa, Maram and others said “the best way to cope and to develop is to finish our education Others reflected their coping mechanisms by engaging themselves in extra curricular and social activities that seems to be constructive and positive in nature as said by Ibrahim, Suzan and others from Ramallah "we enjoy volunteering in any social and national events in our area of residence or the school". Others reflected their coping mechanisms by engaging themselves in extra curricular and social activities that seems to be constructive and positive in nature as said by Ibrahim, Suzan and others from Ramallah "we enjoy volunteering in any social and national events in our area of residence or the school". Gaza children coping mechanisms and social involvement have reflected their tragic situation as Mohammad 18 and others said “we participate in demonstrations, and many times we were exposed to violence” while Majed and Munir said “many times we helped other families in evacuating their houses before it was bombarded”. Gaza children coping mechanisms and social involvement have reflected their tragic situation as Mohammad 18 and others said “we participate in demonstrations, and many times we were exposed to violence” while Majed and Munir said “many times we helped other families in evacuating their houses before it was bombarded”. 14 What has your government done to respect, protect and fulfill the rights of war-affected children? Some children described the government as helpless and cannot protect any one, and do not expect any thing from this government as many said “the government in siege, how can it be of help”. Tareq, and others found an excuse to the government performance as said “the government is loaded with the political issues”. Mohammad 18 appraised the role of government in offering free health and education services for children. Some children described the government as helpless and cannot protect any one, and do not expect any thing from this government as many said “the government in siege, how can it be of help”. Tareq, and others found an excuse to the government performance as said “the government is loaded with the political issues”. Mohammad 18 appraised the role of government in offering free health and education services for children. On the contrary, the majority were critical to the Palestinian Government role in providing the minimum requirement to protect the Palestinian children’s rights to survival as Abdulla 16 from Gaza said “the government personnel are busy to keep themselves on their seats”. On the contrary, the majority were critical to the Palestinian Government role in providing the minimum requirement to protect the Palestinian children’s rights to survival as Abdulla 16 from Gaza said “the government personnel are busy to keep themselves on their seats”. 17 How have diplomatic efforts, such as resolutions and treaties prepared by the UN and its member states, have helped children affected by armed conflict? 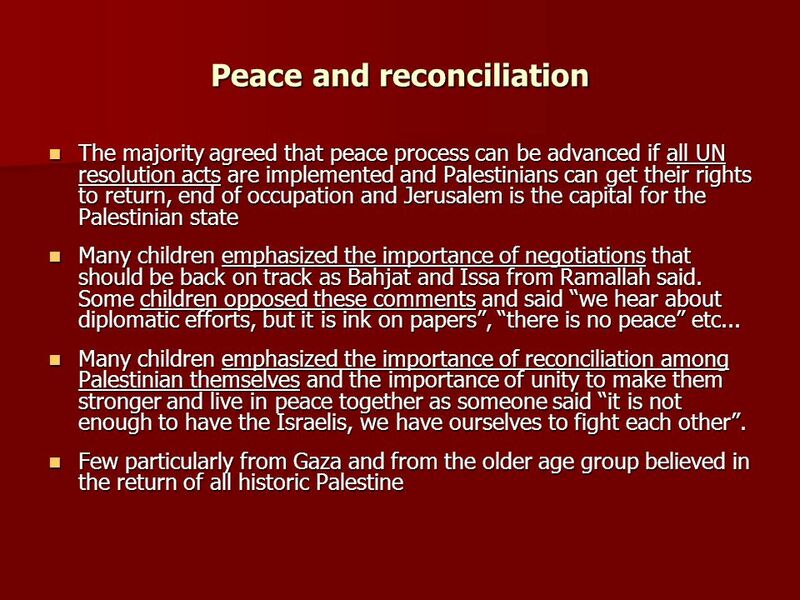 The majority of the children 14-18 and agreed to the useless diplomatic efforts and Peace treaties proposed by UN and international communities. Mohammad 18 and Fidaa 17 and many others commented “despite the continuous diplomatic efforts and resolution acts been made by UN for the last 60 years, nothing was implemented on the ground”. The majority of the children 14-18 and agreed to the useless diplomatic efforts and Peace treaties proposed by UN and international communities. Mohammad 18 and Fidaa 17 and many others commented “despite the continuous diplomatic efforts and resolution acts been made by UN for the last 60 years, nothing was implemented on the ground”. When referred to the UN declaration of children’s rights; no one agreed to that and believed all Palestinian citizens human rights including the children have been violated. 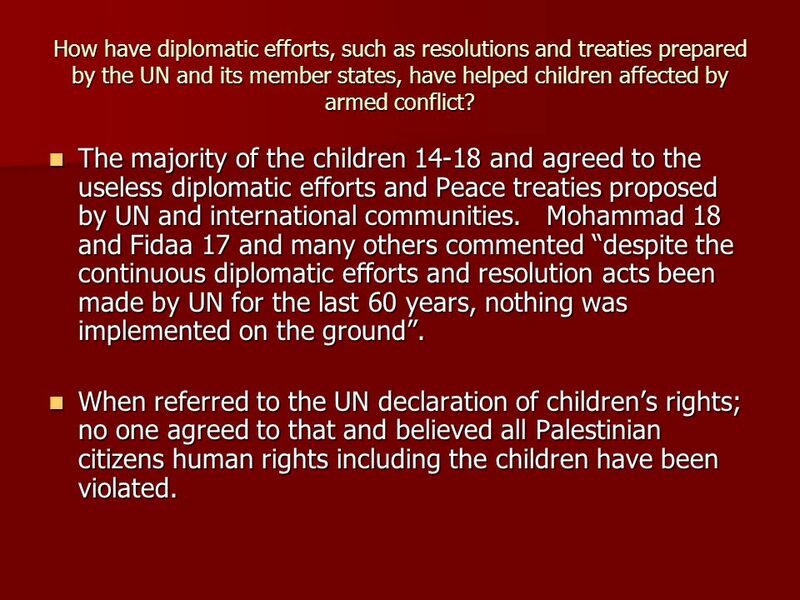 When referred to the UN declaration of children’s rights; no one agreed to that and believed all Palestinian citizens human rights including the children have been violated. 19 What opportunities are there for young people to participate and express their concerns? The majority agreed to the limitation of opportunities for them to express their needs and concerns not because they are not allowed to speak out but because of the deteriorating and constrictive environment and lack of opportunities to do so. for example; Nidal and others said “we play sports in the neighborhood as alternative to playgrounds”. The majority agreed to the limitation of opportunities for them to express their needs and concerns not because they are not allowed to speak out but because of the deteriorating and constrictive environment and lack of opportunities to do so. for example; Nidal and others said “we play sports in the neighborhood as alternative to playgrounds”. Few children have the opportunity to participate in some extracurricular activities through some local organizations as, but many others were critical as said “how many children do benefit or have an access to these NGOs”. Some girls and others emphasized the importance of the use of the computer and net Few children have the opportunity to participate in some extracurricular activities through some local organizations as, but many others were critical as said “how many children do benefit or have an access to these NGOs”. Some girls and others emphasized the importance of the use of the computer and net Mohammad and Tareq from Gaza commented “the impact of socio- economic and political situation has contributed to increase the children affiliation with either political or religious groups as a mean to express their views and channel their energies”. 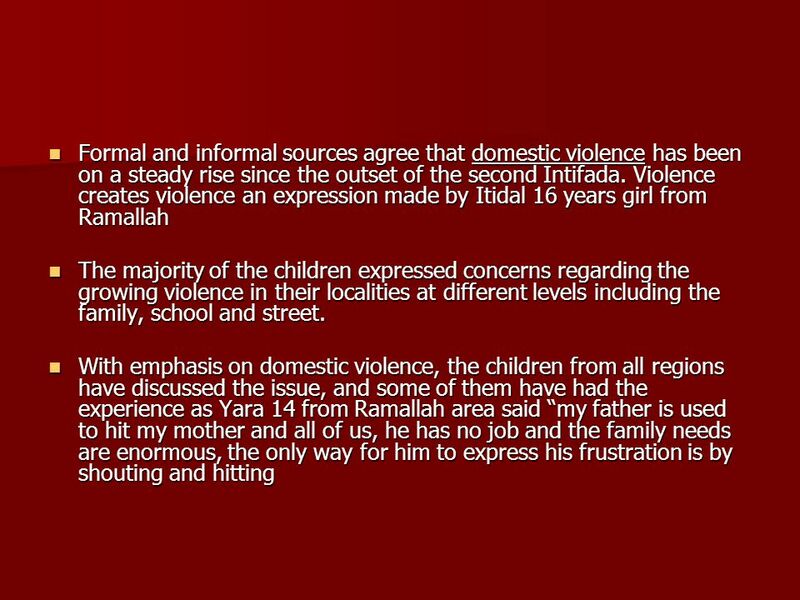 Mohammad and Tareq from Gaza commented “the impact of socio- economic and political situation has contributed to increase the children affiliation with either political or religious groups as a mean to express their views and channel their energies”. 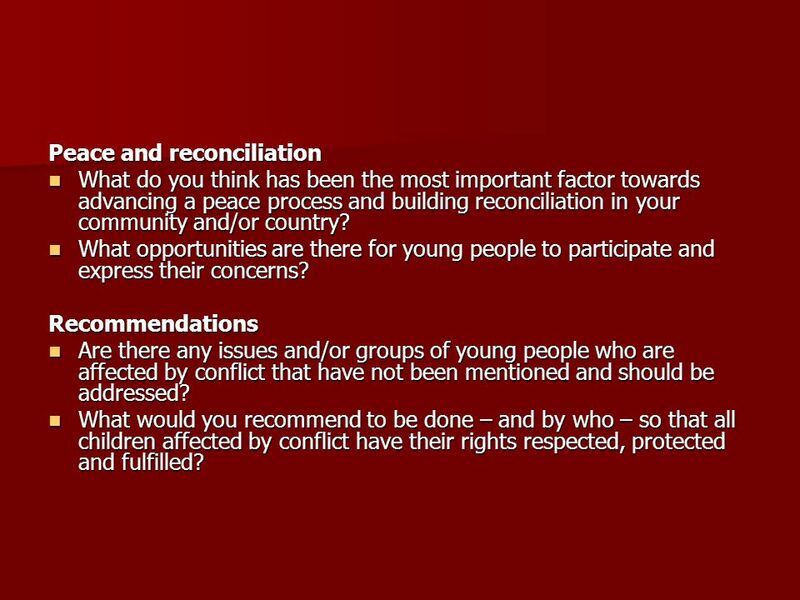 20 Recommendations Are there any issues and/or groups of young people who are affected by conflict that have not been mentioned and should be addressed? The older age group mentioned four important issues regarding child care and right to live in dignity that should be addressed by the Palestinian government, NGOs and UN agencies: The older age group mentioned four important issues regarding child care and right to live in dignity that should be addressed by the Palestinian government, NGOs and UN agencies: disabled children who got injured by the Israeli army and the importance of their integration into the society, education and in finding job opportunities for them. disabled children who got injured by the Israeli army and the importance of their integration into the society, education and in finding job opportunities for them. Care for orphanage children who are numerous as a result of their father deaths due to struggle or any other orphan and lack institutional or any source of assistance. Care for orphanage children who are numerous as a result of their father deaths due to struggle or any other orphan and lack institutional or any source of assistance. 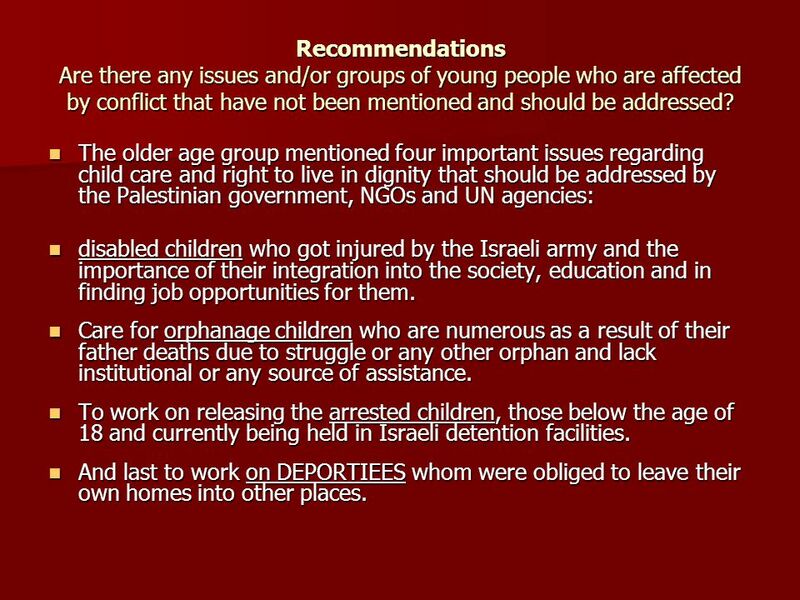 To work on releasing the arrested children, those below the age of 18 and currently being held in Israeli detention facilities. To work on releasing the arrested children, those below the age of 18 and currently being held in Israeli detention facilities. And last to work on DEPORTIEES whom were obliged to leave their own homes into other places. And last to work on DEPORTIEES whom were obliged to leave their own homes into other places. 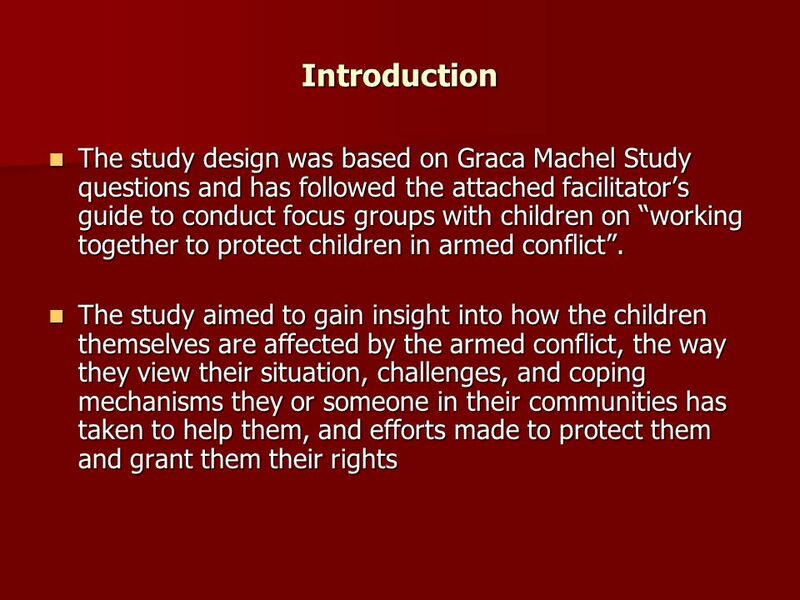 Download ppt "Palestinian children in armed conflict Report Sumaya Y. Sayej RN MSN Ph D AL-Quds University Submitted to UNFPA June 10/2007 Presented as part of the Garca." 1 The Rights of the Child Qualitative Eurobarometer study Paul Stamper Deputy Managing Director TNS opinion October 2010. Israel. Post WWII In 1947 the United Nations proposed dividing Palestine into an Arab nation and a Jewish nation. In 1947 the United Nations proposed. Young Peoples' Leadership 1 Young People’s Fellowship Fellowship conference July 2006. Faculty of Development & Society - Affirming Achievement 1 Multiverse Project Analysis of High Attaining Black Students: Factors and Conditions that Affect. The importance of Education in Emergencies - Reflections from children and youth in eastern DRC. NGOs Intervention Policy: Development and Peace Ibrahim Natil, PhD Conflict Research Society Leeds University September 3, 2014 Ibrahim. Karna Thapa Faculty of Law, T.U. PROTECTION OF WOMEN AND CHILDREN IN ARMED CONFLICT.